We create the present and future in our meetings and conversations every day. What can we do to increase the likelihood that we’re creating a future that we all want? 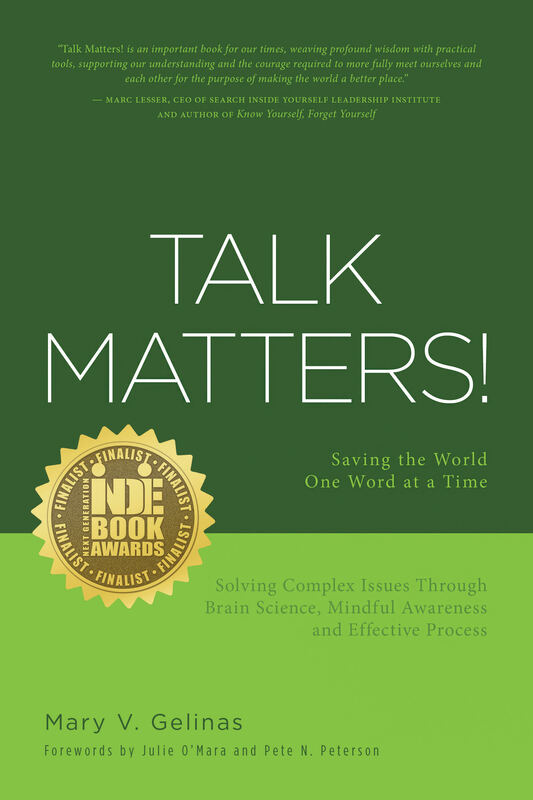 We can start by talking more constructively and productively about what matters to us all.After decades of advising groups in the private, public, and nonprofit sectors, process design and facilitation expert Mary V. Gelinas has integrated her best knowledge of brain and behavioral sciences, mindful awareness, and effective process to create Talk Matters! Her eight essential practices offer us ways to avoid getting hijacked by our survival instincts, engage with people who differ from us, and open ourselves, our businesses, and our communities to real, lasting change. As she explains, good process can help us work better together to do good things for the world.In this highly readable and accessible book, Gelinas uses real-world examples to illustrate the practices that can help you start achieving life-serving results in your interactions as a leader, participant, or facilitator today. 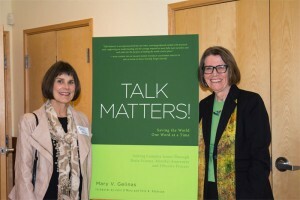 Click here to see photos from the Talk Matters! book release party.